Heal. Heat. Relax. Energize. Rejuvenate. 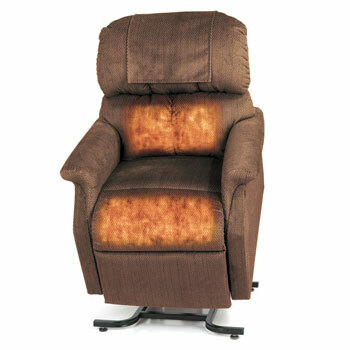 Experience the numerous healing benefits of Far-Infrared Heat, exclusively on Golden Technologies' lift chairs! It feels better! Far infrared heat is a natural wave emitted directly from the sun. It's the deep heat we feel when standing in the sunshine. Now you can have that same feeling of deep penetrating heat in your lift chair without the sun's harmful UV rays! Far Infrared Heat Lasts Longer! Far infrared heat penetrates so well that it heats from the inside out! When you use this heat system in our lift chairs, you will notice the heat lasts long after you leave the chair. Two Pads... Twice the Heat! We've strategically located two far infrared heat pads in our lift chairs -- one in the lumbar area and the other behind the legs, giving you maximum exposure to this soothing, penetrating heat! Far Infrared Heat Promotes Wellness! Far infrared heat provides many wellness benefits. By having this heat system in our lift chair you can enjoy both the comfort of our furniture with the benefits of far infrared heat!